Using a statistical model for male and female world record progressions, researchers at Monash University, Australia, predict that 1:58.05 is likely the fastest time that any living human being will be able to run a marathon. The sub-two hour mark could be reached by 2032. Published in Medicine and Science in Sports and Exercise – the American College of Sports Medicine's flagship journal – the data suggests that the chance of a female athlete ever breaking the two-hour mark is less than 1 in 100, with the fastest all-time female marathon time estimated to be 2:05.31. This study is the first to address all three related aspects of world record marathon performance in one modelling framework – the sub-two hour limit, the limits of human physiological running capacity, and gender equivalence. It also highlights the potential barriers that elite female athletes face in marathon running resulting in something of a "world record drought", with Paula Radcliffe's 2:15.25 mark, set in 2003, still standing. A 'sub-130 minute' project (2:10.00), advocated in this study, would empower female long-distance athletes. The marathon has an official distance of 42.195 kilometres (26.219 miles) and was one of the original Olympic events in 1896. 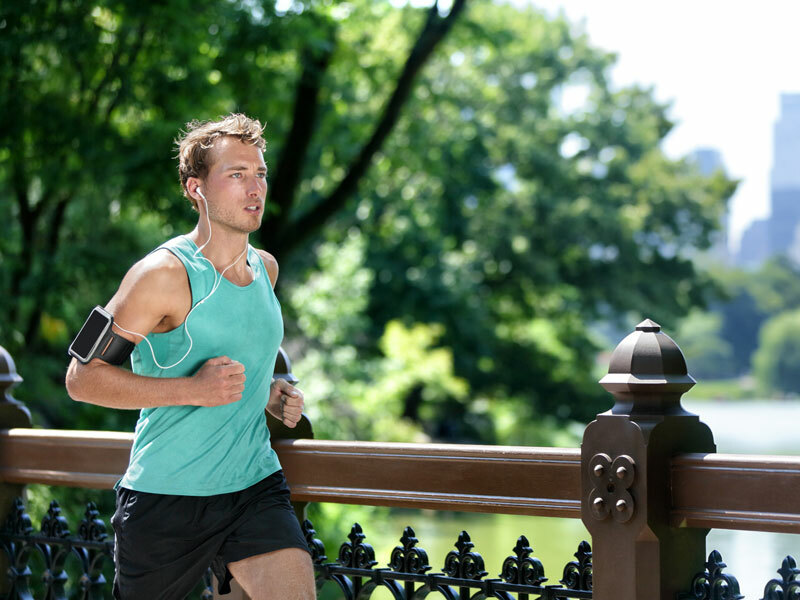 More than 800 marathons are held across the world each year, with tens of thousands of participants taking part in this physically gruelling event. "Breaking the sub-two hour marathon in an official event has attracted growing interest in recent times, with commercial and international momentum building," says Dr Simon Angus, Associate Professor of Economics at Monash Business School, and himself an ultramarathon runner. "The prospects of a male athlete going sub-two hours in an IAAF event, even in the near future, would appear high given that the most recent world record reduced the mark by 78 seconds, and the Nike 'Breaking2' project produced a time just 25 seconds outside this two hour barrier. However, a 13-year wait seems more in line with the evidence." As part of the study, Dr Angus applied a robust, non-linear economic model to all official IAAF record marathon performances of men and women since 1950 to calculate record-breaking prediction intervals. From there, he was able to reconceptualise the 'sub-two hour question' as one of odds – for example, when will a given time be run with 1 in 10, or 10% likelihood. Using these figures made it possible to determine the limits of human performance for male and female marathons; the performance gap between the current male and female world record to the limiting times; and the equivalent of the 'sub-two hour' threshold for women and when this will be achieved. The economic model was tested on the past records, in addition to projecting the future. It is, on average, accurate to within 1% for males – or 70 seconds – across a 66-year period, which sees a 19 minute reduction in the world record. For women, the accuracy is within 3% – or 200 seconds – and the record time is reduced by one hour and 22 minutes. "In other words, if an IAAF marathon were run in May 2032, then I would predict that there is a 10% chance that a runner in that event will break the two hour mark," explains Dr Angus. The probability rises to 25% for the year 2054. "The current male world record holder, Eliud Kipchoge from Kenya, is just a fraction outside the sub-two hour mark with a time of 2:01.39 – a record he set at the Berlin Marathon in 2018. By inspecting the prediction lines on my economic model, there was only a 2% chance that the sub-two hour record would be broken at that point in time. 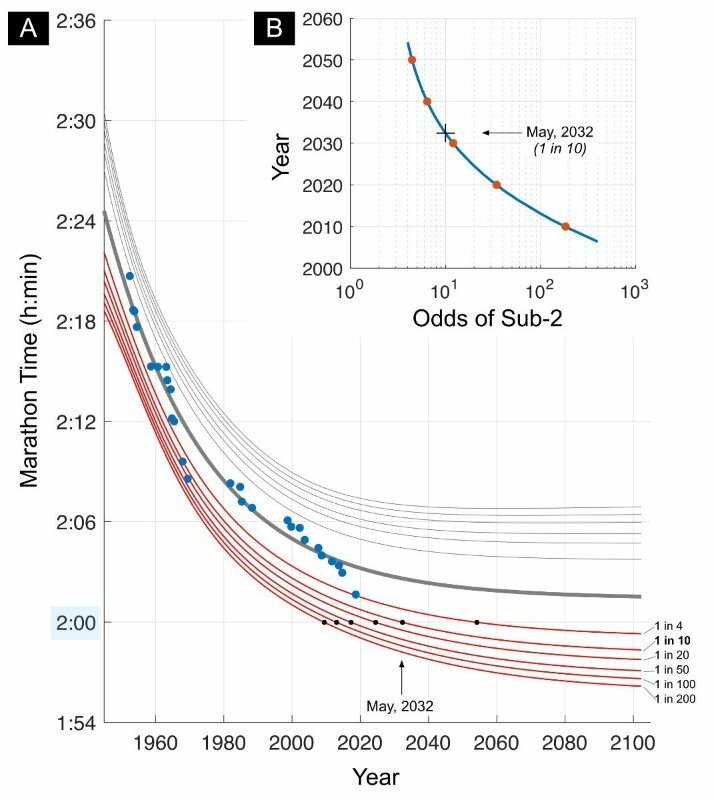 While a sub-two hour run could occur anytime between now and 2032, the likelihood of that occurring is extremely rare." Using the same model and 10% likelihood approach, Dr Angus calculated that the likely human performance limit for male and female marathon times is 1:58.05 (performance gap to current world record of 2.9%) and 2:05.31 (performance gap of 8.6%), respectively. He also used the model to identify the equivalent of the sub-two hour marathon for female athletes. "Based on the equivalent performance gap to the expected all-time fastest time for females, a target of 2:10.00 or the 'sub-130 minute' project would be a reasonable focal point to build international momentum around," he said. The study adds statistical weight to the existence of a quantifiable lack of record progression in the female marathon over the last decade – in particular from the African gene pool. "In my opinion, this finding should cause public and private actors to work harder at reducing barriers and increasing opportunities for elite female athletic performance. The evidence of this study and others like it is that there are likely world-record female marathoners living today, principally in Africa. We just don't yet know who they are," he concludes.